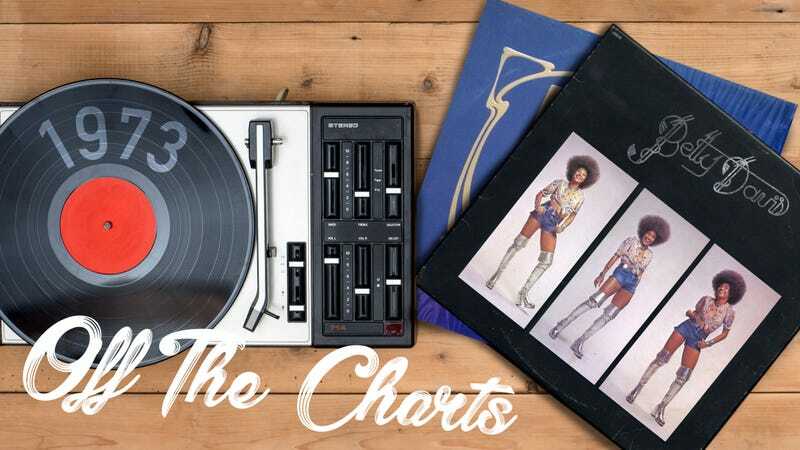 Off The ChartsTo commemorate 60 years of the Billboard Hot 100, Off The Charts revisits each year since it was established to spotlight songs and artists that didn’t make the cut, yet still made a significant impact. HBO’s short-lived Vinyl got a lot wrong. That ridiculous, tedious murder subplot. Its use of corporate party-level look-alikes to play David Bowie, Robert Plant, and John Lennon. Putting its loudest, jerkiest character at its very center, and so on. But it got at least one thing right: Pop music had indeed become incredibly, embarrassingly boring in 1973. Whatever rebellion rock had promised in the 1960s had bloated into stadium-filling, private-jet-flying, double-album-recording excess. Folk had similarly lost touch with any sense of revolution, giving way to a litany of singer-songwriters who humbly went by their given names (making that year’s Billboard charts resemble a phone book), but who largely produced easy listening glurge. All that extravagance produced some unquestionably great albums: Pink Floyd’s The Dark Side Of The Moon. The Who’s Quadrophenia. Queen’s self-titled debut. But suffice it to say, any year whose top 20 is bookended by Tony Orlando And Dawn’s “Tie A Yellow Ribbon Round The Old Oak Tree” and Cher’s “Half-Breed” is one that—like Vinyl’s Richie Finestra—makes you want to snort blow and scream. And although the world had indeed yet to get hip to DJ Kool Herc, who was that year inventing hip-hop down on Sedgwick Avenue, 1973 had a lot more soul than Tony Orlando’s dominance might suggest, with The Wailers’ massive hit Burnin’ bringing reggae into the pop mainstream, and sheet-rumpling songs by Marvin Gaye, Roberta Flack, and Billy Paul presumably producing their very own mini-baby boom. To utterly contradict what we just said, any year in which Curtis Mayfield’s “Superfly” lands on the charts can’t be wholly dismissed as boring. Still, there’s no denying that if you were, like the pin-eyed A&R execs of Vinyl, to cast your sweaty gaze at the top 20 and the general state of popular music in 1973, you too would probably be flailing about, desperately looking for what was next. But if they had only bothered to look at some of the artists on this list, they might not have gotten so worked up about it. Maybe Vinyl would have even gotten a second season. When Gladys Knight introduced Jobriath to a Midnight Special TV audience in 1974 (mangling his name as “Joe-bray”), she called him “the act of tomorrow.” A bit lofty, considering that Jobriath’s arch, theatrical glam-rock was then very much the act of today—or even the act of a few years before, as many pointed out when they derided him as a shameless, American copy of Ziggy Stardust-era Bowie. It also proved darkly ironic, considering that Jobriath himself soon after faded away, all but forgotten by the time he died, alone at his piano, in 1983. But it was typical of the pomp that surrounded Jobriath—the alien-dandy name adopted by piano prodigy turned dispossessed hustler Bruce Wayne Campbell—whose self-titled debut was announced with an enormous billboard over Times Square. Despite good reviews, it made a rather broadsided target for those resistant to hype, and sales were poor—not helped at the time by Jobriath’s declarations of being “rock’s truest fairy,” the first openly gay aspiring rock star in a climate only then grappling with glam’s androgyny and sexual overtones.